As the winter months quickly approach many of you enthusiasts out there are anticipating all the fun to be had outdoors in the snow, and yes, even on the ice. If you’re an avid fisherman you probably don’t want the winter months to slow down your sport, in which case you definitely want to come check out this quickly growing winter pastime here in the mountains of Maryland. Deep Creek Lake ice fishing is worth the visit this winter! The Lake Pointe Inn, located on shores of this gorgeous lake, is a perfect place to warm up after a day on the frozen waters. Deep Creek Lake is the state’s largest man-made reservoir, rounding 69 miles of shoreline and an average of 25 feet of depth. It is home to bass, trout, northern pike, bluegill and many more species. You’ll notice the fisherman scattered about the lake huddled around holes in the ice. Their jovial laughter echoes around the lake as they as they try to stay warm with silly chatter while goading the fish up from their warm place at the bottom of the lake. Although done in the dead of winter ice fishing doesn’t require much more equipment than when done in other seasons. You will need to dress warmly, and it’s recommend that you wear a life vest under your coat in case of emergency. Carrying an ice pick around your neck is another great precaution as it will help you climb out of the water should you fall in. Warm, waterproof boots are a must. January and February are the months where the ice is usually at its thickest, making fishing the safest. You want to stick to ice that looks blue or clear, as opposed to gray or anything slushy. Four inches is the minimum depth you’re looking for. 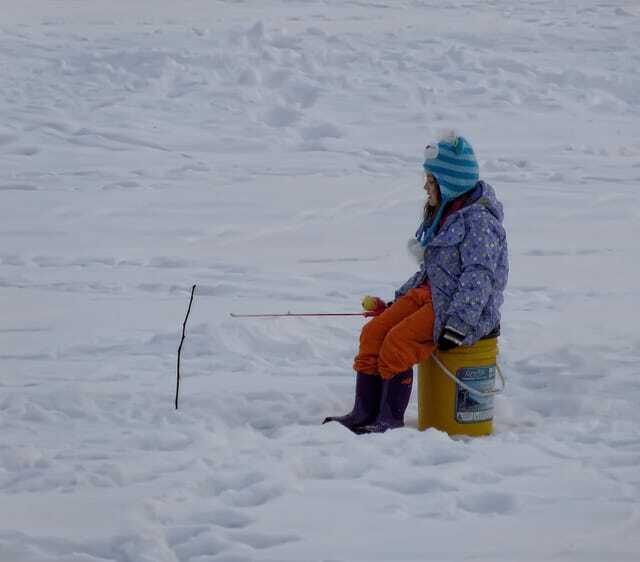 If you won’t have a ice fishing shelter you’ll definitely want to bring a chair or something else to sit on. A tip-up flag is a great thing to have that will add to your time for companionship by freeing you up from standing over your hole in the ice. The Deep Creek State Park has a great safety guide for Deep Creek ice fishing, which would be a great thing to familiarize yourself with before you head out. If you’re heading here with Deep Creek ice fishing in mind we recommend you bring your kids or a good friend to keep you company out there. The Lake Pointe Inn is a great place to enjoy all kinds of winter adventures. If you’re all fished out after one day on the lake consider hitting the slopes for some downhill or cross-country skiing. Or maybe you’d prefer to snuggle up with a good book and enjoy the Deep Creek view from beside one of our cozy fireplaces. A lovely cocktail hour with hors d’oeuvres and wine will be a lovely finish to any of your preferred winter activities, just before you head to one of our great local restaurants for a warm meal. We look forward to seeing you this winter. Stay warm!